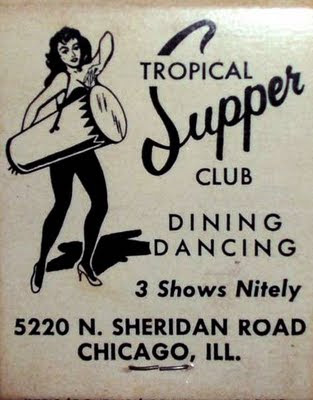 A matchbook from The Latin Quarter Tropical Supper Club. Today the spot is home to Les Skin Care and Acupuncture and Herb Healing. I was recently cleaning out my grandpa's old photos, and I found a picture of my grandma at a table at The Latin Quarter. The photo is inside a paper booklet provided by the club. I was happy to find your post so I could learn a little something about this moment in her history. There were a few other photos like this from different clubs, so Grandma liked to have a good time.